“I’m the bad guy,” says Jesse in episode 1 of the season. At the end of episode 13, he proves himself right. 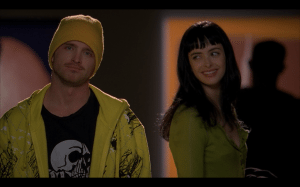 The relationship at the center of Breaking Bad is the one between Walt and Jesse. Walt is the brain, and Jesse is the heart. Walt doesn’t need Jesse. He’s given a chance to get rid of him, but doesn’t take it, instead risking everything to keep Jesse alive. And yet, in so doing this, he turns Jesse into a murderer. It’s such a wonderfully demented relationship. 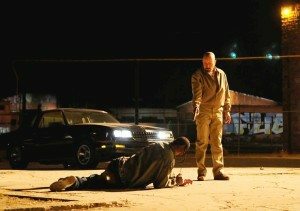 Walt continuously saves Jesse only to further destroy him. Episodes 11 and 13 both begin with flashbacks, a popular gambit this season. In 11, we see Jesse and Jane together at the Georgia O’Keefe exhibit she’d once talked about. They later discuss O’Keefe’s series of door drawings. Jesse thinks the woman must have been obsessed and insane. Jane counters that doing the same things again and again is what makes up life. At the end of the episode, Gus invites Walt to his house, his very normal, pleasant house. Wants to show Walt the kind of life one can lead, if one is careful. Gus has a piece of advice for Walt: “Never make the same mistake twice.” He’s referring to Jesse. 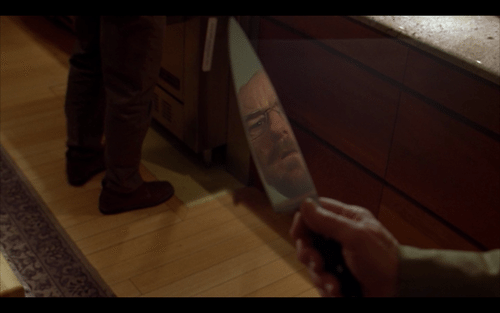 Gus hands Walt a knife…to show his trust. In his recovery meeting, Jesse finds out that Badger and Skinny P aren’t willing to sell meth to recovering addicts. So Jesse says he’ll do it, and goes after a young woman, Andrea. They hit it off. Then he learns she has a son, Brock, age 6, and suddenly the idea of selling meth to her doesn’t seem so great. When she wants some anyway, he yells at her for being a rotten mother. Bad move. An argument ensues, and eventually she tells Jesse the story of her younger brother, Tomas, age 11, who’s been recruited by a gang to sell drugs. They even made the kid kill a rival dealer. Jesse puts the pieces together. Tomas is the kid who shot Combo. Meanwhile, Skyler wants to know how Walt’s money, which they’re now using to pay for Hank’s physical therapy, is laundered. 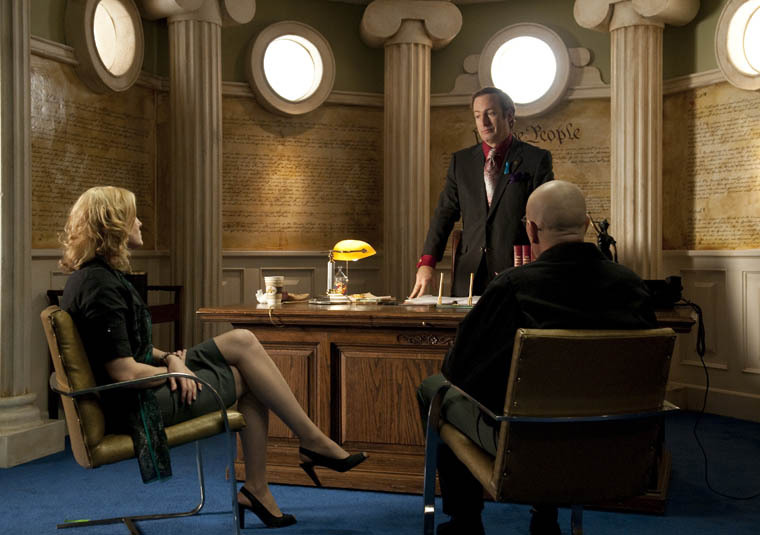 Walt introduces her to Saul, who wants them to buy a laser tag business. Skyler has a better idea: buy the carwash Walt used to work at. Problem is, there’s no “Danny” at the carwash, i.e. a manager who’ll look the other way. Skyler tells Walt she’ll be the Danny. Walt’s not keen on this idea. When she next brings it up, Walt finally caves, but agrees to the plan only if he can move back home. No way. They bargain for number of days per week Walt can come over for dinner, plus he wants a key to the house. A deal is struck. Skyler’s going to be a part of Walt’s schemes after all. Episode 12 opens with a delightful musical ode to Wendy, the meth-addicted prostitute, showing her day of blowjobs, root beer, and meth. This ends with Jesse watching her deliver burgers to the bad dudes who made Tomas kill Combo. Jesse has a plan. Jesse meets with Walt and asks for ricin to kill the dealers. He’s going to have Wendy put it on their burgers. Walt says no way. “It achieves nothing,” he says, and “You are not a murderer.” Well, not yet. Jesse isn’t swayed. He’s going to do it himself if he has to. Walt goes to Saul. How to stop Jesse? 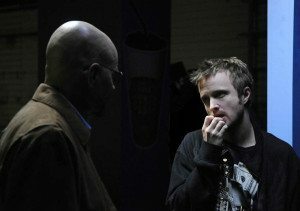 Walt suggests having Mike get Jesse arrested for some small offense, thus keeping him safe in jail. He’s telling Walt that Jesse needs to go. It’s time to get rid of him. 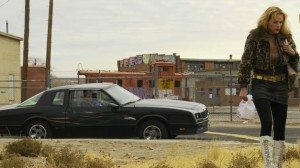 Jesse sits in his car with Wendy and the poisoned burgers, waiting for the gangsters to arrive, but they’re mysteriously absent. Mike appears, hauls Jesse out of the car and drives him to the chicken ranch for a meeting with Gus. Also present: Walt and the two gangsters, Gus’s loyal employees. Gus demands Jesse apologize and be done with it. Jesse refuses. He can’t believe Gus would use kids to sell drugs and kill. So Gus tells the gangsters: “No more kids.” And Jesse shakes hands with them. Gus also makes clear to Jesse that Jesse is alive thanks only to Walt, that everyone else wants him dead. And maybe that would do it—maybe—until Andrea gets a phone call. 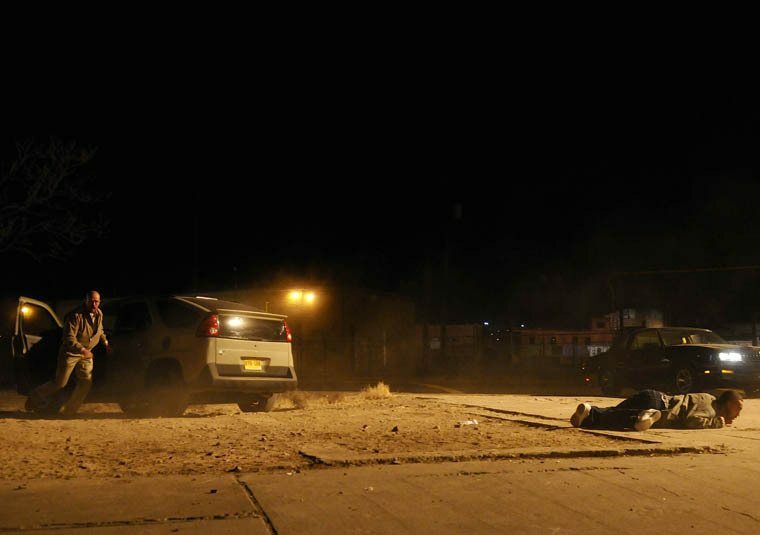 Tomas has been shot dead. She and Jesse rush to the crime scene. That’s it. Jesse snaps. Walt sees the news of Tomas’s murder on TV at home. He sits at dinner, deep in thought—and suddenly gets up and leaves. Now that’s how you end an episode! So much great stuff there. For one thing, Walt’s now a murderer. It’s not an act of self-defense, as one could argue Krazy-8’s killing was. It’s not an act of omission, as with Jane. Walt out and out kills two guys who work for Gus, for one reason only: to save Jesse. Which is the other beautiful thing about this, the way Walt completely misinterprets Mike’s advice. Instead of giving the okay for Jesse to be taken out, he doubles down on keeping Jesse alive. Now what? 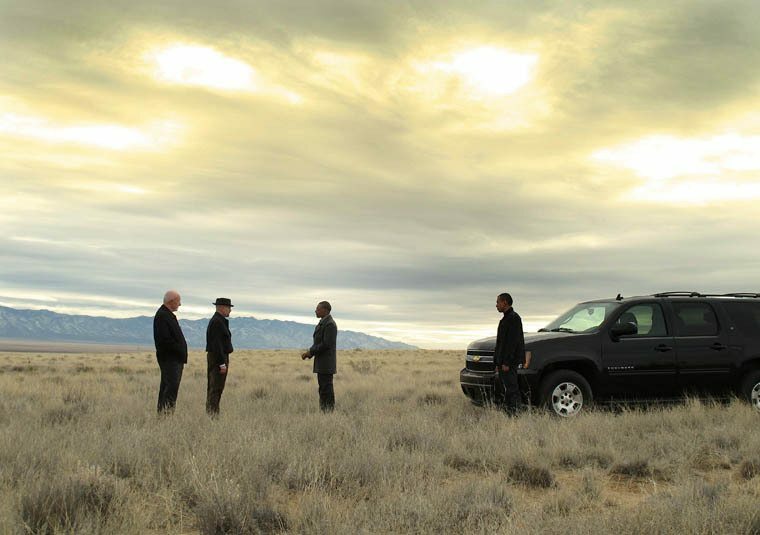 Walt meets in the desert with Gus and Mike. Gus ain’t too happy about things. 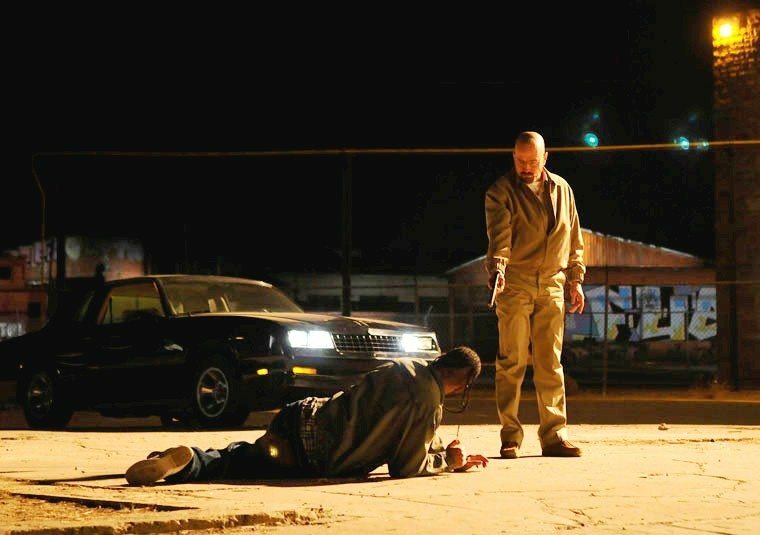 Walt says he had to do it to save Jesse, who right or wrong might assume Gus gave the go-ahead to have Tomas killed. 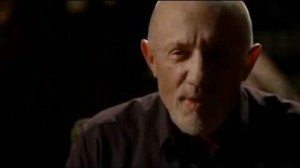 Walt says Gus has two options: he can kill Walt, hunt down Jesse and kill him too, or he can put this hiccup behind them, forget about Jesse, and keep Walt cooking. Gus agrees. What choice does he have? Only this time, he gets to pick Walt’s assistant. Which assistant is of course Gale, who in the lab is excessively deferential to Walt. Then we see Gale at home, which is completely adorable. His apartment is perfect. The rugs, the plants, the telescope, the tea heated to precisely the correct temperature, the wacky music he sings along to. Gus stops by for a visit. He’s got a question: how soon could Gale make Walt’s recipe on his own? Gus explains that Walt has cancer, and might die at any time. Gale’s a meek guy, but says that after one more cook, he could likely take over. Back in the lab, he asks Walt a lot of pointed questions about methodology, with Victor now ever-present, listening in. A few other things are happening too. Hank is suffering through physical therapy. He’s good enough that the doctors say he can go home. Marie is thrilled, but Hank says he won’t leave until he can walk out. Marie fools him into leaving through a clever hand-job ruse. Don’t ask. In any case, Hank heads home. Mike has other problems besides Walt. The cartel sends up some guys to Gus’s chemical warehouse. Mike takes all four of them out to the groovy strains of The Beastie Boys. A lot of great music in this show. Have I mentioned that yet? Well, you watch it. You know. Mike also tells Saul he’d better cough up Jesse’s location. Saul leaves Mike a notebook with an address in Virginia. But Jesse’s still in town. 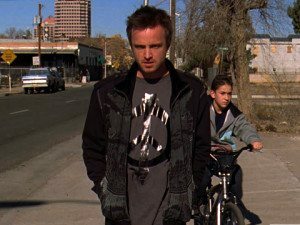 Saul brings Walt to meet Jesse inside the laser tag arcade. Once again, Walt knows exactly what’s going on: that Gale is being groomed to replace him, that Walt will be killed shortly. The only way out is to kill Gale. Gus can’t afford to let production stop. If Walt’s the only cook, he’ll have leverage. He needs Jesse to kill Gale. Jesse can’t do it. He tells Walt to turn himself in and go into witness protection. He begs Walt not to kill Gale. But Walt sees it as the only option. Tells Jesse to find Gale’s address. Which he does. Walt leaves home at night to go kill Gale, when Victor shows up and tells him there’s a spill in the lab. But Gale’s got his music on too loud. A knock at the door. It’s Jesse, pointing a gun at him. Gale begs for his life. Jesse is either going to break into tears or shoot him. He shoots him. Cut to black. This is also how you end an episode, and a season, for that matter. It’s the first real cliff-hanger season ending. When you step back and look at this season, it’s really part one, with season 4 as part two. 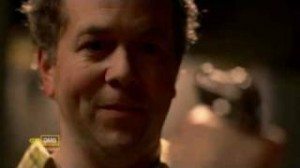 It’s one long story arc of Walt coming into Gus’s orbit, being played as a pawn, finally taking matters into his own hands with an outrageous and provocative act, then struggling for power and, at the end of season 4, emerging victorious. Season 3 is like an eddy of characters swirling around each other, slowly coalescing into the power play between Gus and Walt that makes up the bulk of season 4. Which I will be watching posthaste. Time’s a wasting!